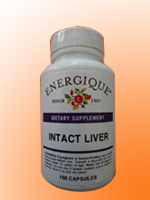 Raw Liver Concentrate 455 mg.
Energique® raw tissue concentrates are processed using a method called lyophilization. During the process of lyophilization, a freeze-drying technique, the raw tissue is concentrated in the first solute phase, never reaching the freezing point; however the second phase (solvent) remains below freezing during the entire process. As a result of using low temperatures, there is less molecular movement, and therefore a minimum amount of loss. Raw tissue concentrates are used mainly for their rich nutrient content. Lyophilization is a concentrating process, not an extraction method. It is superior to an extraction process in that in an extraction method, some of the desired nutrients are lost.